If you and your friends love bubbles then our Champagne & Sparkling Wine Tastings are perfect for you! We host regular events in London at Raymond Blanc's warm & welcoming Brasserie Blanc on the Southbank as well as The City Rooms in Leicester and The Marriott Hotel in Liverpool. Our Open Dated Gift Vouchers can be purchased for a special gift experience or a future treat! The vouchers can be redeemed against any of our London Champagne Tastings and UK Wide Champagne Tastings. If you would like us to come to you for a private tasting at your home for a group of 10 or more, we would love to help! Please follow this link to find out more about our Private Champagne Tastings. We run regular champagne tastings in London and various locations across the UK. You can select an open dated voucher to book against any of the forthcoming dates and locations listed below. 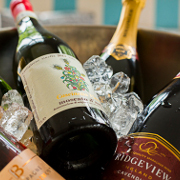 Treat yourself to a Champagne and sparkling wine tasting. We'll taste a range of styles, including Champagne, for you to discover the main differences and pick your favourites. You'll taste 6 sparkling wines including Champagne, Prosecco, Cava and an award-winning English fizz. How do we get the bubbles into the wine? Create a classic champagne cocktail! A huge treat for lovers of all things sparkling, from Champagne and Prosecco to New World and English fizz! Find out why they taste a particular way and whether you can spot the real thing in a line up. You'll taste 10 wines including 3 Champagnes, Prosecco, Cava, Moscato, New World and award-winning English fizz. Vintage vs Non-Vintage - what's the difference? You'll taste 6 sparkling wines, including Champagne, Prosecco, Cava and award-winning English fizz. Discover how chocolate can be a match for sparkling wines and create a classic champagne cocktail! During the evening platters of charcuterie & cheese will be served. Please see forthcoming dates listed below. You'll taste 10 sparkling wines, including 3 Champagnes, Prosecco, Cava, New World and award-winning English fizz. Discover how the way they're produced affects the style and see if you can spot the real thing in a blind tasting! Enjoy a delicious 3 course lunch with a glass of bubbly. Please see forthcoming dates listed below. The start time is 10:45am for a prompt 11:00am start. To find out about booking any of the tastings and to check availability please contact us on 020 8288 0314 or email us.